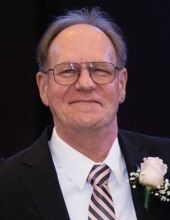 Jerry V. VanEver, 61 of Midland was called home to be with his Lord and Savior on Saturday, March 30, 2019 surrounded by his loved ones, at the Mid-Michigan Medical Center. He died of Renal Cell Kidney Cancer that had spread to his lungs and brain. He was born on September 23, 1957 in Bay City, son of the late Virgil and Freda (Campbell) VanEver. Jerry moved to Midland in 1968 at the age of eleven, attending Midland Schools, graduating from Midland High School in 1975. Jerry married the former Debra Atton on April 24, 1982 in Midland. He worked for Van’s Painting and Decorating for 20 years(a family owned business), for Sears Lawn and Garden and Tool Department for 16 years and went by the name of “Van”. He enjoyed classic cars, watching a variety of sports; Nascar, Tiger Baseball and the MSU Spartans. He enjoyed spending time with family and supporting his son with his music and sometimes being his “roadie” and hauling equipment. Jerry had a great sense of humor and loved making people laugh. He had a strong Christian faith and studied the word of God daily.Jerry is survived by his wife, Debra, one son, Jeremy (Megan)VanEver of Midland, his sister, Brenda (Barry) Croteau, one brother; Gary VanEver and by his mother in law, Loraine Atton, brother in law, Dan Atton, Jr., and by many nieces and nephews. In addition to his parents Jerry was preceded in death by his identical twin brother, Perry VanEver in 1981 and by his father in law, Dan Atton Sr.
Funeral services will take place at 11:00 Friday, April 5, 2019 from the Ware-Smith-Woolever funeral home, 1200 West Wheeler Street. Rev. Joshua McLaren will officiate. Jerry’s family will receive friends at the funeral home on Thursday from 4-7 p.m., and on Friday from 10 am until time of service. Those planning an expression of sympathy are asked to consider The American Cancer Society or St. Jude Children’s Hospital. Jerry’s family would like to express their sincere thanks to all the nurses and staff that cared for him the past few months at MidMichigan Regional Medical Center. To plant a tree in memory of Jerry V VanEver, please visit our Tribute Store. "Email Address" would like to share the life celebration of Jerry V VanEver. Click on the "link" to go to share a favorite memory or leave a condolence message for the family.